For Good Beer Week 2018, the festival's Good Beer Mates partner city was London, a city where the beer scene has exploded to the point it's home to more than 100 brewing companies. Among the breweries to make the trip were Fourpure and Wild Card Brewery, both of whom called in to Two Birds so they could leave behind a beer. Both are hop-centric, but they're far from alike. The Fourpure collab is the Nugget Session Pale, a collab that came with an added dimension in that one of the Two Birds brewers, Jaime Clowes, used to work at Fourpure. The beer itself bears the hallmarks of a NEIPA, albeit in a smaller package: hazy and soft on the palate to the point it's almost creamy, and with broad hop aromas reminiscent of the kids tropical juice cartons you'd get in your pack lunch. There's some juice like hop flavours and a faint, borderline resinous bitterness too. 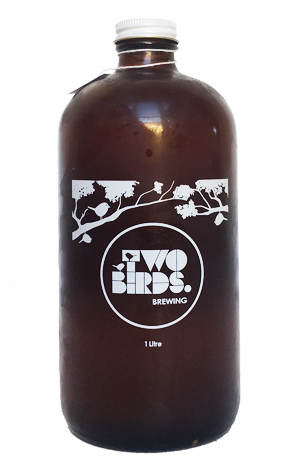 As for Wild Bird, it's the biggest beer either Two Birds or Wild Card has released to date, a double IPA loaded up with Aussie hops. Look out for aromas of ripe pineapple, apricot, stewed tropical fruits, pine and even a hint of vanilla. There's candied fruits and sweet, prickly booze on the palate, at least until a resinous, piney bitterness slices right through the middle.